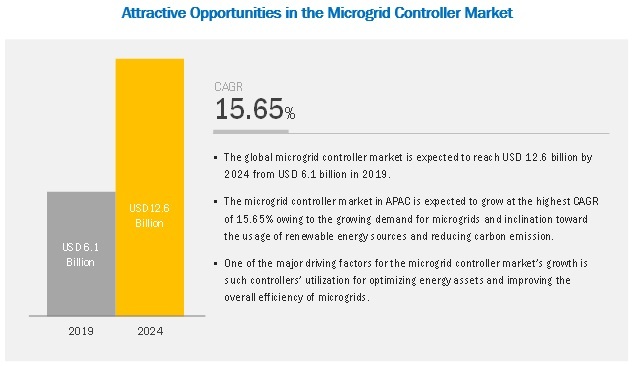 [151 Pages Report] The overall microgrid controller market is expected to grow from USD 6.1 billion in 2019 to USD 12.6 billion by 2024, at a CAGR of 15.65% from 2019 to 2024. The growth of this market is being fueled by the rising demand for microgrids and increasing shift toward usage of renewable energy sources and reducing carbon footprint. The microgrid controller system market by offering includes hardware, software, and services. The market for the software segment is expected to grow at the highest CAGR during the forecast period. This growth is due to its crucial role in monitoring, prediction, managing, and optimization of energy supply and demand for a microgrid network. Microgrid controllers operate in 2 modes: isolated or grid connected. Isolated microgrids are designed to operate independently, without connection with the main grid. Grid connected microgrids have higher reliability than isolated microgrids as these are connected to main utility grids. Thus, grid connected microgrids are expected to grow at a higher CAGR during the forecast period. The defense sector has been the major adopter of microgrid technology that allows buildings or bases to stay functioning on its own power when the grid goes down. From big players such as General Electric (US), Lockheed Martin (US), Boeing (US), and Honeywell (US) to small specialty technology firms such as Spirae (US) and Power Analytics (US) cater microgrid solutions to this vertical. The Americas is expected to account for the largest share of the microgrid controller market owing to the presence of key players such as GE Power (US), SEL (US), Lockheed Martin (US), Honeywell (US), S&C Electric (US), Power Analytics (US), Emerson (US), Princeton Power Systems (US), SPIRAE (US), Homer Energy (US), and Pareto Energy (US) in the region. Major vendors in the global microgrid controller market are Schneider Electric (France), General Electric (US), ABB (Switzerland), Siemens (Germany), Schweitzer Engineering Laboratories (US), Eaton Corporation (Ireland), Honeywell International (US), Lockheed Martin (US), S&C Electric (US), and Power Analytics (US). In April 2018, Schneider Electric announced the launch of EcoStruxure for Energy access—a comprehensive metering, analytics, and reporting solution for microgrid projects. In February 2018, GE collaborated with Arenko Group (UK) to build grid-scale energy storage systems in the UK. Arenko has invested in a 41 MW battery energy storage system supplied by GE. In March 2017, Schneider Electric signed a tripartite agreement with ENGIE Lab (Singapore) and Nanyang Technological University (Singapore) to address the energy access challenge for off-grid areas in Asia Pacific. What are the upcoming products and technologies in the market? Who are the key market players and what are the strategies adopted by them? What are the fastest- or highest-growing segments in the market? What are the major drivers, restraints, opportunities, and challenges for the microgrid controller market? * Business Overview, Solutions/Services/Products Offered, Recent Developments, SWOT Analysis, and MnM View Might Not Be Captured in Case of Unlisted Companies. The study involved 4 major activities in estimating the market size for microgrid controllers. Exhaustive secondary research was done to collect information on the market, peer market, and parent market. The next step was to validate these findings, assumptions, and sizing with industry experts across the value chain through primary research. Both top-down and bottom-up approaches were employed to estimate the complete market’s size. Thereafter, market breakdown and data triangulation were used to estimate the market sizes of segments and sub-segments. In the secondary research process, various secondary sources such as Hoovers, Bloomberg BusinessWeek, and Dun & Bradstreet have been referred to for identifying and collecting information for this study. Secondary sources also included annual reports, press releases & investor presentations of companies; white papers and certified publications; articles by recognized authors; and gold & silver standard websites, regulatory bodies, trade directories, and databases. After arriving at the overall market size using the market size estimation processes explained above the market was split into several segments and sub-segments. To complete the overall market engineering process and arrive at the exact statistics of each market segment and sub-segment, data triangulation and market breakdown procedures were employed, wherever applicable. The data was triangulated by studying various factors and trends from both the demand and supply sides. This research report categorizes the microgrid controller market based on connectivity, offering, vertical, and region.